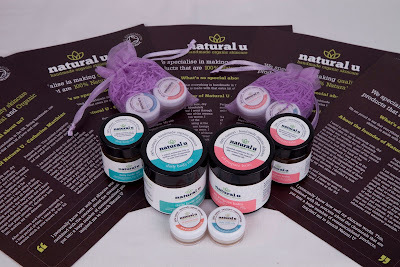 So firstly apologies for not blogging lately as iv been away....but whilst away iv been trialing a couple of fab organic skincare products from a lovely little company called Natural U. 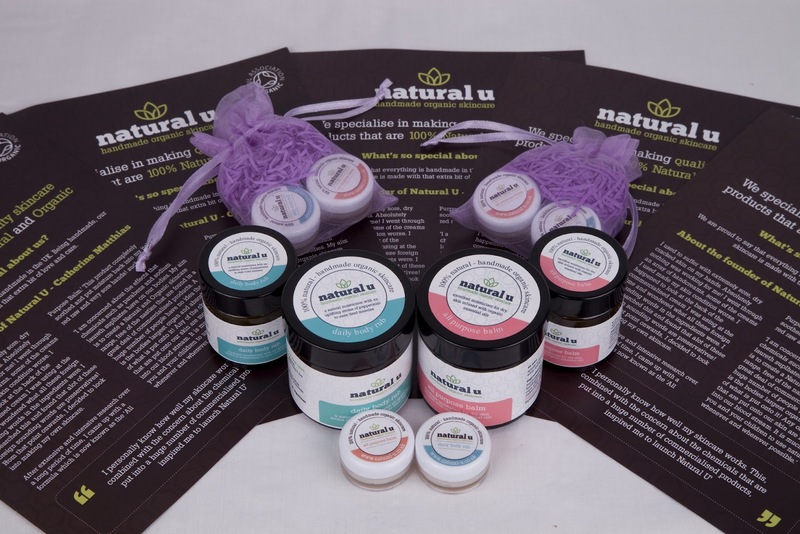 Natural u is the brainchild of 2 ladies Catherine & Nicola. Both of them suffered with dry, sore and itchy hands and had found nothing they bought ever truly solved the problem. So after 2 and half years research they came up with a formula and made the creams for friends and family. Results were amazing...and after years of suffering, the creams actually worked for both of them....so Natural U was born!! Natural U produce 2 main products which are an All Purpose Balm and a Daily Body Rub. Ingredients is 100% natural and is Soil Association Certified. So to the science bit...what goodies does it contain, well there's Shea butter, bees wax, sunflower seed oil, olive oil, calendula oil, chamomile, lavender and manuka. Due to the gentle ingredients, the balm is suitable for all ages groups, skin types and symptoms from baby upwards. Think nappy rash, eczema, cracked skin, sun burn, dry lips...it can be used for all of them...but does it work?? Well i suffer from dry skin on my feet...and after using this balm for a few days the difference is amazing...feet feel moisturised and the dry skin is close to disappearing all together.....it works, really well...simple as!!! The amazing thing is you only need to use a small amount so this small pot will last a long time. Iv used it on my lips, face..anywhere that needs a moisture injection.....love it!!! Brimming full of natural goodness, includes Shea butter, sunflower seed oil, beeswax,olive oil, calendula oil, sweet almond oil, ravensara, eucalyptus,Tea tree and infused with a delicate aroma of peppermint!! The rub is designed to ease aching muscles but can also work well on headaches and tiredness when rubbed on the temples. Again you only need a small amount, but what surprised me was how long i was able to massage for....it lasts for ages, doesn't dry out and the gentle smell of peppermint is lovely and soooo relaxing, my other half is a convert as well....the pot now a permanent fixture in our lounge for when he wants that evening neck or foot rub!!! Again it comes in a 30g (£10.50) and 50g pot (£16.50) ...and his stuff will last you ages!! Proof you don't need any fancy chemicals to create a wonder cream.....these are gentle, natural and simply work. A fantastic company with 2 fab products...all handmade with love.